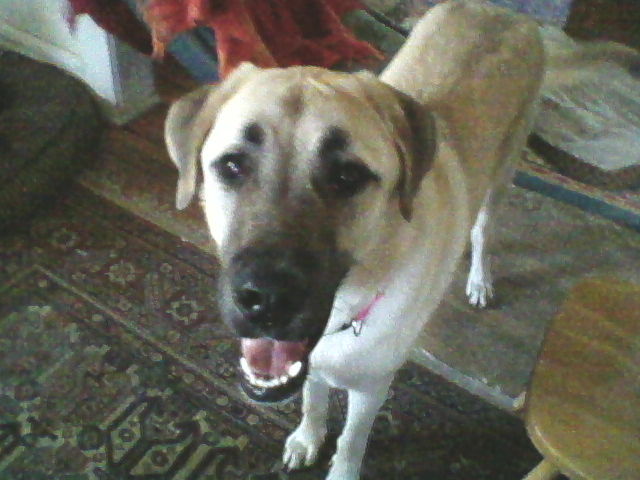 This is Corrina, an Anatolian Shepherd, who is a regular boarding client at sleepydog training. Just have to tell you that this last ‘dose’ of Corrina boarding with you and your Pack has matured her immensely!! Unbelieveable. She’s crossed over into the next dimension hahaha. We are so happy that she is sooooo much more of an awesome dog than ever in every aspect, thanks to you! We recommend you whenever anyone asks us about dog training! Thank you again, Sarah! This is Allie, a Pit Bull. 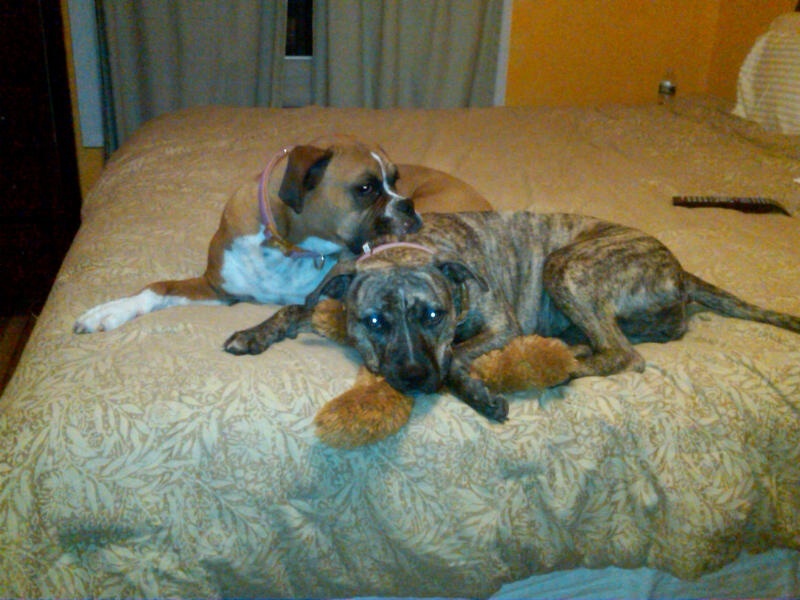 She is pictured here with her sister Coco, a Boxer. Not pictured is her brother, Max, a Sheltie. I just wanted to thank you for all the help you gave me in the beginning with Allie. She has made our home so complete and her and Coco are inseparable. I think back to those early weeks and I don’t know what I would have done without you. I just wanted you to know how much it meant to me. We found a wonderful doggie day care for Allie where she goes once a week to be socialized with other dogs. She does have a bit of unpredictable excitability which is getting better as time passes and with exposure to others. the accidents are at a minimum, the destruction is extremely rare and manageable, and she’s just such a pleasure. Thank you so much for all you do for these animals, and for the time and advice you gave to us. 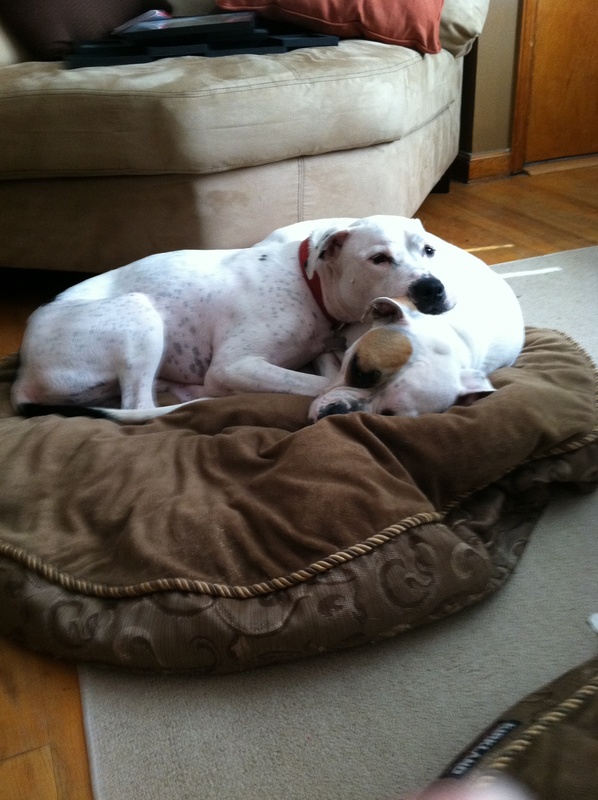 These two cutie pies are Ellie, an American Bulldog and London, a Pit Bull. You'd never guess that sleepydog training was called about these two because they were not getting along and had had a couple of fights. 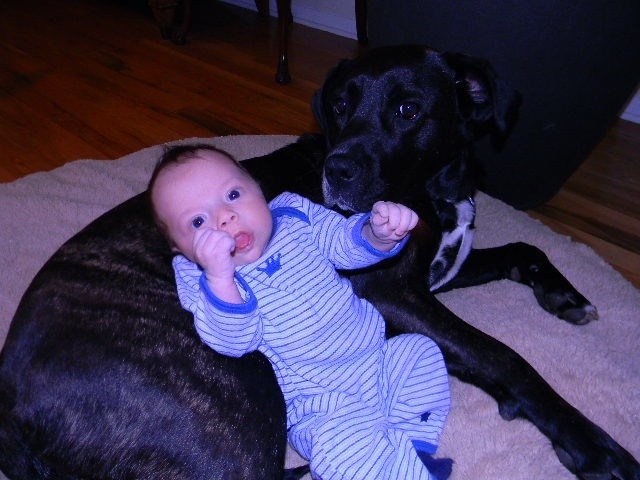 Proper integration and management of households with multiple dogs is one of sleepydog training's specialties. I hope all is well with you. Just wanted to give you an update on the pups. Well Sarah has been extremely helpful. We only had one session with her so far, but she has really helped us to identify certain behavior that might have lead to the problems between Ellie and London. And so far, we have had amazing success! I have attached a few pictures so you can see how things are going. Take a look.. lol! How cute are these two?? It is so sweet because London is really attached to Ellie now. 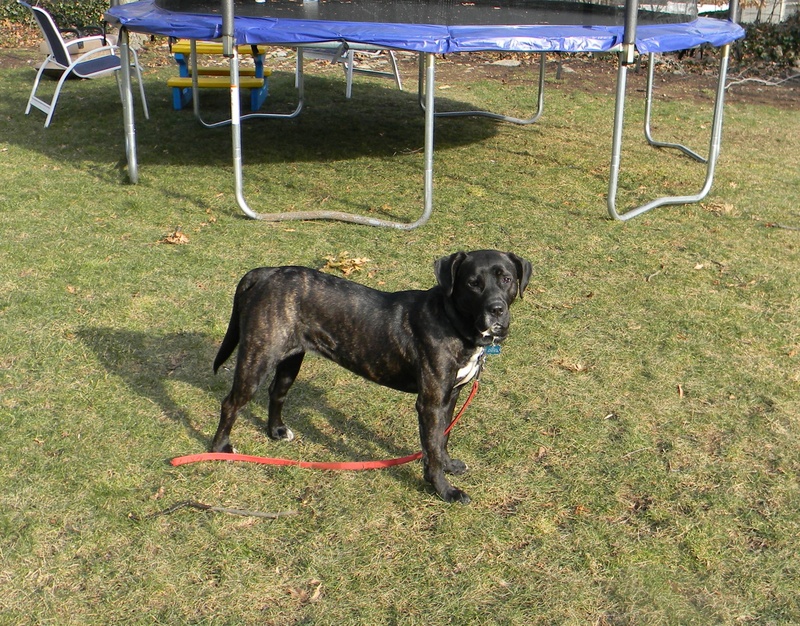 If she is in the backyard without him, he gets very restless, like he is looking for her. One major thing that Sarah pointed out is that some of the aggressive behavior from London was being provoked by Ellie. She was playing but at the same time bullying him to the point that he would snap. But we are conscious of it now and we do not allow her to do that. And the two of them are getting along so well. They snuggle up together all the time for no reason at all. Just because they want to. They can be very affectionate with each other also. It is very sweet. Anyway, we are meeting with her next Thursday after work. We have been in constant contact with her to let her know about any issues or about positive progress. And you are definitely right about her, she is fantastic! This is Hannah. Hannah's story continues to be an inspiring and amazing journey for her human family (three young children, two parents) and for Hannah. tools to refocus her and let her know what I expect from her. My “inner dog trainer” is coming out, and I am really starting to believe that she CAN be rehabilitated! Shoot! P.S. This whole “inner dog trainer thing” works all 3 of kids, too. Bonus!. 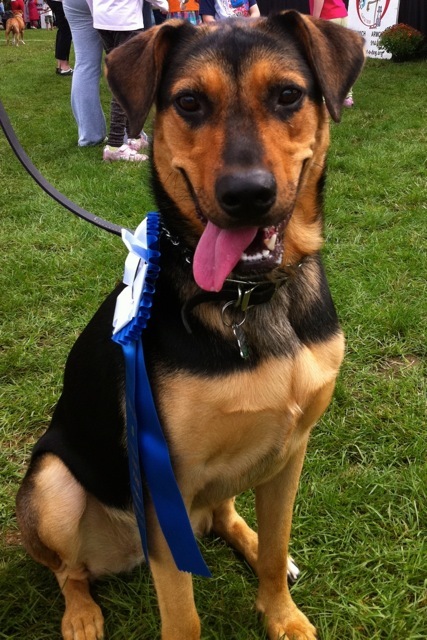 This is Lexie, a large Rottweiler +shepherd + mix, when she won ‘Mixed With The Most’ at an event in CT. Lexie’s family called me when they saw her exhibiting behaviors that they thought might not be safe around a baby. You see, Lexie’s family were expecting a new baby. So many pets are abandoned when a new baby is welcomed into the family. But not Lexie! Her family loves her and is doing the work they need to do so that one day soon, Lexie will be their childs’ best friend and companion. This is another type of training that sleepydog training specializes in. I just wanted to write and thank you for all the time you spent with us and Lexie this past Sunday. Even after a couple days of using some of your tips and techniques, we’re starting to see a difference in her (she seems much more calm!). I do think we are going to do another session closer to when the baby comes – maybe in 6 or 8 weeks. Hopefully, this gives us lots of time to really enforce the items you said we need to work on with her as well as our leadership skills before you come back with ‘the baby’. I will give you a call when we are ready to set up another session. This is Luna. I met Luna, a Pit Bull mix, soon after she was adopted by her lovely family of four, two young children and their parents. Luna’s family contacted sleepydog training because it was clear that she needed some basic social, behavioral and obedience skills. “thank you again so much. we’re in awe of you and your presence with luna. we still have a way to go, especially with the “come” and the biting of the shoes, but we’ll get there. Now, fast forward to almost a year later, and another email from Melissa F.
“Akiva and I were just speaking about you. We’re expecting a 3rd and were discussing having you come in for some tips and suggestions on bringing the baby home. You would hardly recognize Luna – she has calmed down so much (although she will try her best to eat anything off the table) and is so wonderful. What do you think? “Luna is doing great with the baby. She’s clearly not aware of her size and thinks she can sit on my lap when I’m nursing, but she is only interested in being included, and licking emerson’s face. She doesn’t react to his crying and he doesn’t react to her barking. We’re all good so far. Another happy family and their well behaved dog by sleepydog training. sleepydog llc. is bonded and insured. Awwww…Corrina is beautiful! 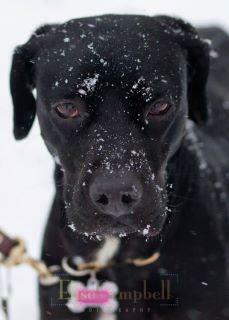 How great that she can get make friends with the pack, get TLC AND training all in one place! You recently came by to help us out with our German Shepherd, Finn. He was having aggression issues towards other dogs. Just wanted to write you and tell you that even after 2 days, we’ve seen a HUGE improvement in his behaviour towards other dogs. Also, he’s much more responsive to our commands and I feel we’re much better equipped with giving him what he needs (mentally). Can’t thank you enough for helping us out! It was truly an experience watching you work!